The stereotype of "Siberia - the place of exile" is a historical fact in Yeniseysk as it was the place where the most undesirables were sent: Avvakum and Archbishop Luke, in the 19th century – the Decembrists and Marxists, and in 1940 - 1950 – high ranked Baits (ministers and intellectuals from Estonia and Latvia). Yeniseysk was founded as a fort for Tobolsk Cossack troops back in 1619. Back then, Russians from the Urals were charting waterways to undeveloped land, searched for places rich in sable, and taxing the locals – with Yasak. In short, they were conquering Siberia. Yeniseysk, originally a small wooden fortress with shooting towers on the corners, in the 17th century became the gateway to the development of land in Eastern Siberia and Baikal spanning to the Pacific coast. Today, Yeniseysk is unique in that it has almost completely retained the look of an 18th-19th century Siberian city. Originally entirely made of wood and later made of stone, a former fortress almost untouched by modern architecture, the city resembles the Soviet era only in the street names - Dictatorship of the Proletariat, Kirov, Workers' and Peasants, Guerrilla and an eternal Lenin in a cap statue in the city center. However, along with the look of an old wooden town with strong huts, carved architraves and white stone churches, Yeniseysk has not lost its provincialism: near the local administration, as it was two hundred years ago, there are grazing cows, and in the city center there are puddles which can be crossed by walking on wooden planks placed over them. Back in 1913, Norwegian explorer Fridtjof Nansen had a laugh over this during his visit to the Yeniseysk province. Yeniseysk is very small. With a map in your pocket (you can buy one at the museum called "Fotoizba"), you can walk around the entire city several times in one day. On Lenin Street and Petrovsky, on the Proletarian Dictatorship alley, to this day you can find private and public stone buildings of the late 18th and early 19th century in the classic Russian provincial style. There are also foreign style stone buildings of 19th-20th centuries, in the “Siberian baroque style" as historian and researcher of urban life in Siberia Yuri Goncharov wrote. Not surprisingly, in the early 19th century, Yeniseysk was considered one of the most beautiful cities in Siberia. Lenin Street is the most popular and well-groomed in the city. Here, almost every house is an architectural and cultural treasure (Yeniseysk is part of a list of Russian monument-cities). But the crumbling walls of Dementiev’s beautiful "house with a mezzanine" from the early 19th century, dilapidated brick publishing building made in the late forms of architectural eclecticism, or the Epiphany Cathedral tired and lost in scaffolding, unwittingly expose the uncomfortable difference between the city’s charming antiquity and its frightening dilapidation. But even with its sadly dilapidated historic buildings, Yeniseysk can still charm with its historic monuments. On Kirov Street, you can see the majestic wooden barn of a late 19th century merchant by the name of Hraznov - a rare example of a merchant’s development. Architectural gems can be found by simply walking along the unpaved residential streets. Remaining there are two-storey wooden residential houses of the late 19th - early 20th century and delicately carved Yeniseysk one storey huts, that have settled into the ground with the weight of time. In the first half of the 19th century, Yeniseysk lost importance as a trading and economic center and began to fade: the administrative center of the province became Krasnoyarsk, which was on the Moscow-Siberian railway. But, according to the perception of contemporaries, Yeniseysk then became a kind of spiritual center of Siberia; it is still this way today: every year dozens of pilgrims visit the city. In bright sunny weather, this small city could really be compared to the gold-domed Moscow. The Spaso-Preobrazhensky Monastery Complex is framed by a baroque, undulating fence which makes it visible from almost anywhere in the city and the main building of the monastery, the Savior Cathedral, is decorated with exquisite stone patterns of brick. 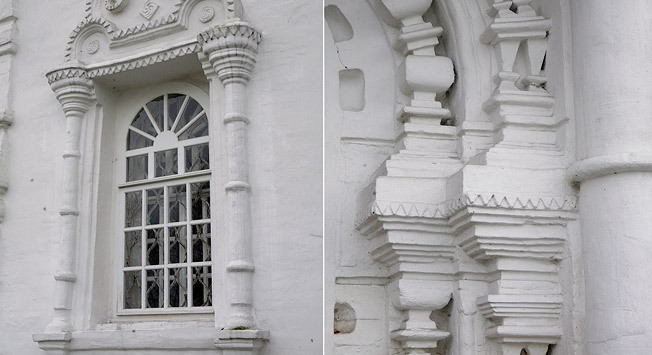 The Uspenskaya Church is made in the traditional Siberian baroque style, its appearance more restrained in comparison with earlier Yeniseysk temples, but inside the church is decorated with patterned floor tiles and hundred year old furnaces "Gollandki” which heat the building to this day. From the steeples of the Uspenskaya Church and the Spasskovo Cathedral, you can see a beautiful view of the river and Yeniseysk. You can try your luck and ask for the priests permission to enjoy the city from this high up. But one of the most amazing gems is the Trinity Church with its original decorated facade, built in 1772-1776 and hidden in the depths of urban street of Perensona. In Yeniseysk, it is also worth taking a look at the museums because they are quite special here. Lenin Street, next to the city’s small market where sad looking women sell Chinese sneakers and tights, is a beautiful and still relatively strong house of merchant Zakharova from 1898. Now it is the Yeniseysk historical museum, in which for one hundred rubles you can order an hour long tour of the city. Holiday clothes of the Tungus, household and trade items of the Kets and Yeniseysk Ostyaks (the aforementioned all indigenous peoples of Siberia), polished samovars and blacksmith rarities, Soviet artifacts and icons – all can be seen in the museum for 50 rubles (the price of admission) – it means $2. At the intersection of Lenin and Lytkina, stands at first glance a seemingly unremarkable wooden house, and only a nailed sign with the handwritten inscription "Fotoizba. Open 7 days a week" shows that it is a museum. As you push open the wooden door, you feel like you are in a welcoming and charming hut as opposed to a preserved repository of antiquities. Amateur photographer and collector of antiquities Peter Drozdov is known throughout the city: in 1997 the man bought this wooden hut from 1887 and began to put all of his effort in to building his own house museum. In the center of the hut there is a white Russian fire oven (if you touch it – it’s warm! ), there is a carved wooden chair, the walls are decorated with old photographs of Yeniseysk, paintings, cards on the table – a huge mirror, a gramophone, tin cans from Monpanse candies, and overhead, a vintage slightly hoarse sounding clock. In the "Fotoizba" there are items from Yeniseysk daily life and culture, that otherwise would be considered old junk, that continue to live. Not behind glass on poised shelves, but rather displayed in the home, seamlessly linking history and modernity. In the courtyard, the local historian-collector has an entire economic complex: a sauna, which can be fired up, stables with an old carriage, a barn and a smithy. This house museum truly lives; so many people including travelers consider it the best modern landmark in Yeniseysk. Unfortunately, there aren’t any good cafes in Yeniseysk. You can eat a heavier meal at dining halls such as "Duplet" at 80 Fefelova street and "Energy" in the "I - Center" mall on Lenin street near the museum. You can grab a drink at the "Chocolate" bar at 69 Lenin street and get pastries at the bakery near the old printing house at 3 Diktatury Prolitariata street.